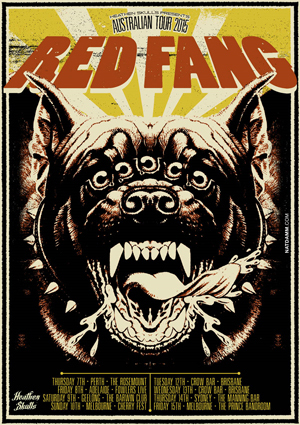 Fresh off their North American tour with OPETH and IN FLAMES, Portland, OR hard rockers RED FANG have announced a headlining tour in Australia/New Zealand this May. The tour comes on the heels of the band's headlining appearances at the renowned Desertfest along with numerous European and Russian tour dates. RED FANG have also recently confirmed various European festival appearances this summer including Hellfest, Forta Rock, Copenhell, Mighty Sounds Festival and many others. A complete listing of upcoming dates is included below. RED FANG recently premiered their new animated video for “Crows In Swine”, the third single off their third album Whales And Leeches. The clip which was animated and directed by Adam Avilla can be viewed HERE.